From Infogames’ 1992 Alone in the Dark to Bethesda Softworks’ 2005 Call of Cthulhu: Dark Corners of the Earth, there have been plenty of computer games which have drawn upon the works of H.P. Lovecraft for their inspiration. Now, there is a computer game based not directly on that author’s works, but upon the premier tabletop roleplaying game based upon said works, Call of Cthulhu, as published by Chaosium, Inc.. 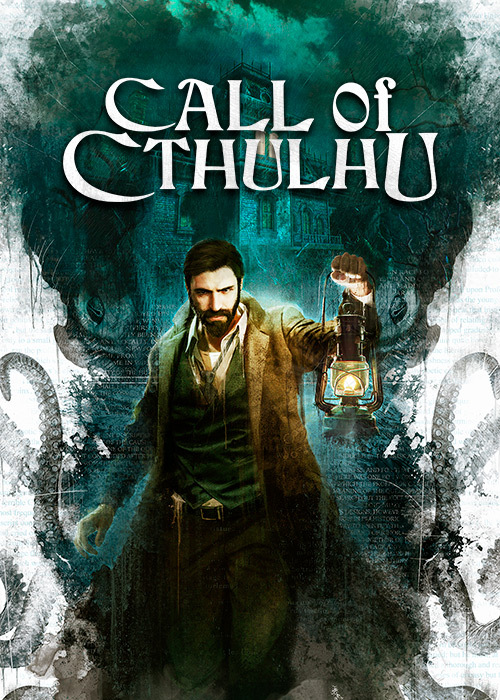 Published by Focus Home Interactive, Call of Cthulhu: The Official Video Game is a first-person computer role-playing game of survival horror and psychological horror available for PlayStation 4, Xbox One, and Windows platforms. Although inspired by Lovecraft’s famous short story, ‘The Call of Cthulhu’, Call of Cthulhu: The Official Video Game shifts the action to closer to home—somewhere off the coast of Boston, Massachusetts in the year 1924. You play as Edward Pierce, a down-at-heel private investigator, whose experiences in the Great War have left him prone to dark dreams and driven him to drink (and at the height of Prohibition too!) and drugs. Suffering from an existential crisis and at the point of being fired by his employers, Pierce grabs at the one straw which might save both him and his job. Noted artist, Sarah Hawkins and her family died in a fire in their home which the police claim she started because she was crazy. Her father, rich philanthropist and art collector, Stephen Baxter, thinks otherwise and so hires Pierce to investigate the death of his daughter, her husband, and their son, out on Darkwater Island, home to a whaling community which Pierce will discover has secrets to hide… This case might really be his last! The ensuing investigation evolves over the course of several chapters which will take Pierce to Darkwater Island, around its harbour, and to various locations above and below the island. At each, Pierce will interact with the island’s inhabitants and discover clues that will first reveal the strange and unhappy life of Sarah Hawkins and her son, and then the deeper, darker secrets behind that strangeness and unhappiness. The investigation is conducted in three ways. First is in clues to be found—typically indicated by magnifying glass icons; second, in interacting with the island’s inhabitants; and third, in flashbacks. The latter represent Pierce putting together clues and interpreting them to reveal previous events. The design of Pierce and how he improves from chapter to chapter is simply, but nicely handled. Pierce has just seven broad skills— Eloquence, Investigation, Medicine, Occultism, Psychology, Spot Hidden, and Strength, each defined as a percentage and competence rating, Novice, Amateur, Professional, and so on. Of these, Medicine and Occultism can only be improved by making discoveries within the game, whilst the others require Character Points, earned chapter by chapter. An improved skill enables Pierce to take a particular approach to the investigation. Obviously, a good Spot Hidden enables Pierce to find more clues, but a high Investigation lets him pick a lock which alternatively, he could just smash with a high Strength. Higher skills will also unlock more options when interacting with the game’s cast of characters, enabling Pierce to ask them questions related to that skill. Overall, devotees of the roleplaying game, Call of Cthulhu, will recognise much of this skill system, which offers a degree of versatility in choosing how Pierce approaches the mystery in the game. Noticeably absent are any combat skills and whilst there are combat encounters to be had in certain chapters of Call of Cthulhu: The Official Video Game, they are very much not its focus, and really, they do not quite fit its dour slow-paced investigation. In addition, Pierce has a Sanity tracker. Unlike the skills, this is not represented by a number, but by series of incidents and encounters that he will have as he delves deeper into the mystery. As he has more of these, the more icons on the Sanity tracker are unlocked and the more that Pierce has suffered Mental Trauma. He begins the game with one—a dream which you play through at the very beginning of the game—and he will definitely acquire more, especially as he comes to encounter the Mythos later in the game. As you play through the Call of Cthulhu: The Official Video Game, what becomes apparent are two things. First, the pace of the game is measured, perhaps even slow, so there is a lot of moving about to find clues before moving on to the next chapter. This is very much in contrast to the Call of Cthulhu tabletop roleplaying game where a lot the time spent in detection and gathering clues is truncated and handled as a narrative. Here, the investigation is played out, the moving from room to room, the looking at one bookshelf or under a table, so in comparison it feels much slower. That said, this allows the mystery and atmosphere to slowly build and the horror to be more effective when it does appear. Second, there is a strong sense of confinement to the game. Now some of this is due to the linear nature of the game and its storyline, and in some chapters, where Pierce is confined to a cave system or an asylum, for example, this works in its favour, but in other chapters, it feels enforced and artificial. For example, the opening scenes on Darkwater’s harbour feel as if there should be more to them, as if you should be able to wander off into the town itself, but everything is blocked off. There are reasons for this in the story, yet it feels very much as if your progress and your ability to roam are being constrained. In terms of game play and presentation, the Call of Cthulhu: The Official Video Game is slightly underwhelming. Beyond the versatility of the skills system, the game never quite feels as if a player has to do very much to carry out Pierce’s investigation and whilst stealth and combat scenes add some variety they do not add greatly to the game play. Really, it feels more like Pierce is just collecting clues rather than collecting clues and interpreting them. This is because for the main part, despite being able to re-examine the clues, there are no further clues to be had about anything that Pierce picks up in the game and the game will do the interpreting for you anyway. Similarly, there is relatively little in the game for the player to deduce, little in the way of the puzzles to solve, the game play’s investigative aspect really being quite simple. Further, whilst the presentation of the game is suitably grim and murky, the graphics are often to be found wanting, especially in the portrayal of the game’s cast. There is a certain slack-jawed mannequin quality to many of them, which again gives the game a feel of artificiality in places. The game is also designed to be replayed, having more than one ending, depending upon Pierce’s discoveries as part of his investigation throughout the mystery and the various insanity inducing encounters he has had along the way. Unfortunately, the linear nature of the game’s plot and play-through means that the variations are fairly limited, so it is questionable whether you would want to replay the game any time soon after having completed it. As a game, the Call of Cthulhu: The Official Video Game cannot match the quality of the best games to be released in 2018, whether in terms of game play, look, or replay value. It certainly feels as if it should play better, look better, and offer more replay value. As an adaptation of the tabletop version of Call of Cthulhu, the Call of Cthulhu: The Official Video Game is not and cannot be its equal. The tabletop roleplaying game offers greater depth and flexibility, wider originality and more variety, and both extended play and repeated play, but that is what it is designed to do, whereas the Call of Cthulhu: The Official Video Game is not. There is some flexibility in the skills system in the computer though, a flexibility that devotees of the tabletop version of Call of Cthulhu will recognise and appreciate. It might not be the greatest computer game or the greatest computer horror game, but what the Call of Cthulhu: The Official Video Game does offer is an interactive, if linear, story of lurking fear and growing dread, one that will take several hours to fully explore and experience. There is enough horror and enough Mythos present for the Call of Cthulhu gamer, the Lovecraft devotee, and computer horror game player to appreciate and enjoy the Call of Cthulhu: The Official Video Game as long as their expectations are not raised too high.